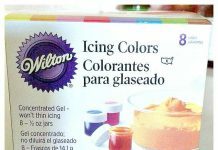 Do people ever question certain foods you like to eat or drink in the summer? Not the winter, but just the hot summer time. They might say things like, ‘How can you eat that (insert said food/drink) when it’s so hot outside?” No one ever really questions you when you have a big bowl of ice cream in the dead of winter, just because you wanted it, right? Well, that’s why I’m going to talk about soup. They’re hydrating- hello, lots and lots of liquid! A warm bowl of soup isn’t bad for you just because it’s not freezing cold outside. 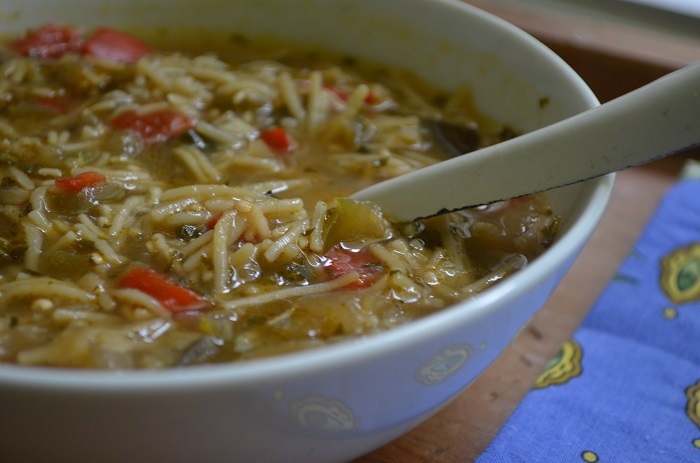 Besides many vegetarian soups are great even when served at room temperature or chilled. Think gazpacho! When breaking the fast, a small cup or bowl of soup can help your body ease into eating food again. Going straight to your stomach, it actually prepares it for the next thing you feed it. Soups are a great extender- it can feed a lot of people with fewer ingredients, making it an economical dish that is perfect for large families or hosting large amounts of people. Soups help your weekly menu, a LOT. Why? Because all you have to do is make a huge pot of of it and a family of four to six can have it for at least a couple of days. Most soups also freeze well. I’m a fan of soups, especially vegetarian ones so I may be a bit biased on the taste of it all, but the truth is that soups are a great accompaniment to main meals for all of the above reasons. The trick really is getting the base flavor done right, which all depends on what you want your soup to taste like, in terms of type of cuisine. This soup I’m showing you how to make here is more of a Mediterranean style soup, but much of the ingredients grow in my Illinois backyard during the summer, so it can very well be an all-American summer soup recipe, too. What I love about it is that it’s vegetarian, so it can be eaten at room temperature and still taste good, and you can tweak it in all sorts of ways to make it different, make it your own. 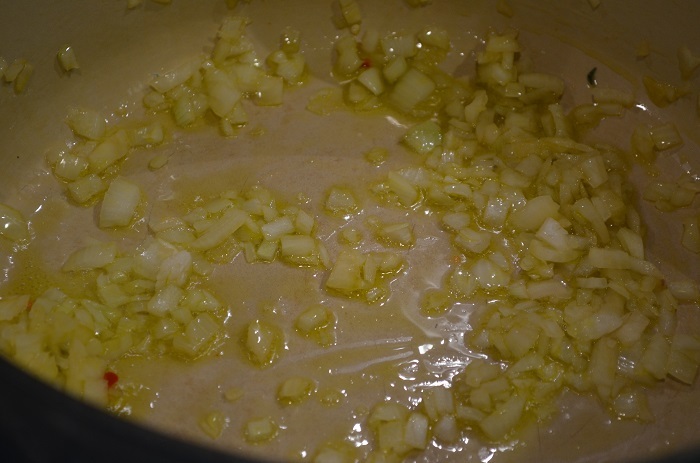 It starts out with the basic base of almost every good soup: olive oil (or some kind of healthy oil), onion, garlic. Adding the peppers makes it a little more unique and could almost add a Latin flair if it were not for the eggplant. 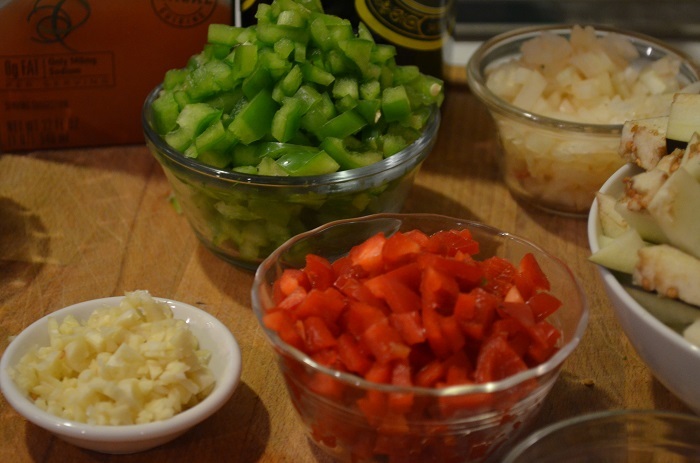 If you were going for an Asian flavor, you might use sesame oil as a base; for a South Asian flavor you could try adding fresh ginger to the garlic and onion base; for something more Italian, add tomatoes/tomato paste, or even a mix of celery/carrot/onion- also known as mirepoix. I chop up everything quite small in this recipe because vermicelli noodles (aka: “fideos” in Latin circles) are chopped and small, too. I don’ t want the veggies to overpower that; I want them to match. 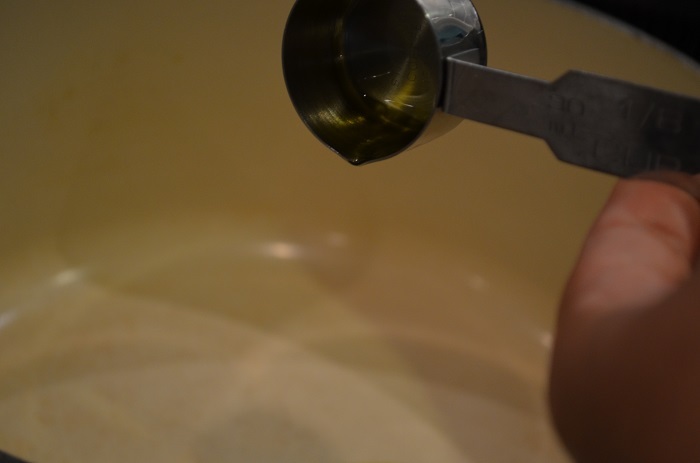 Add olive oil, about 1/8 cup which equals 2 tablespoons. Did you know that those handy small measuring cups make it super easy to measure out the commonly-called-for 2 tablespoons? Once the oil is hot but not burning, of course, I add the onions. Don’t let them brown too much. 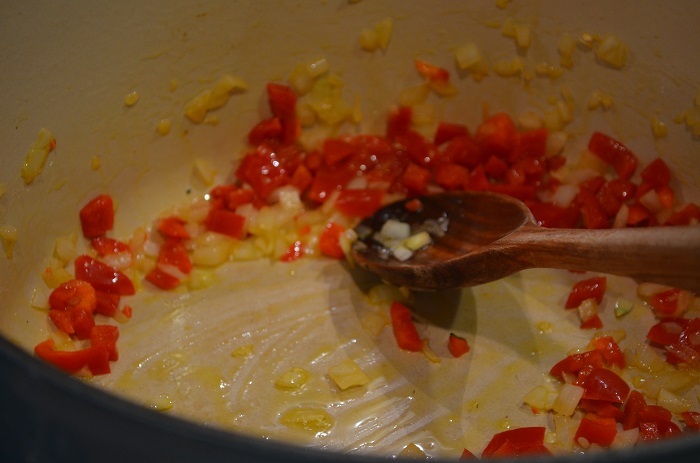 Add the red peppers. And the green ones. Or vice versa. It doesn’t matter which color goes in first, at least not to me. 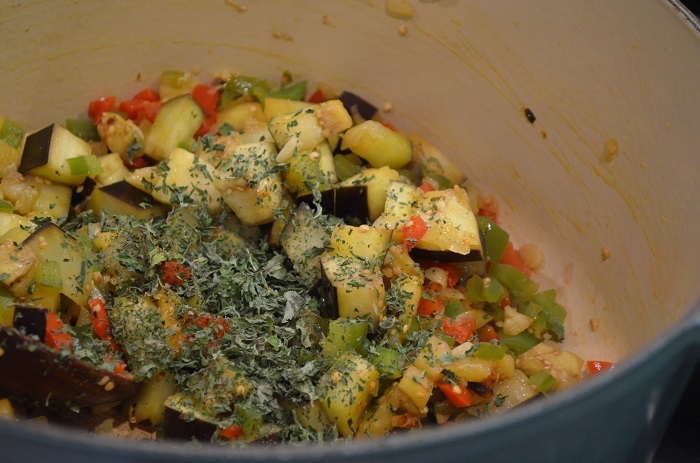 Add the eggplant and the garlic. I don’t like garlic to burn- it turns dishes bitter when that happens. Instead, I always try to add it with another cushion- in this case, that’s the soft eggplant. Next, add the freshest dried herbs you can find. I recognize that’s an oxymoron. But, it’s true. Find the best dried spices because they’re most pungent. I picked mine, let them dry out for three days in my kitchen and they were perfect. All I had to do was crush them. It’s a mix of about one to two tablespoons of basil, oregano and mint. Add sea salt and black pepper, to taste. 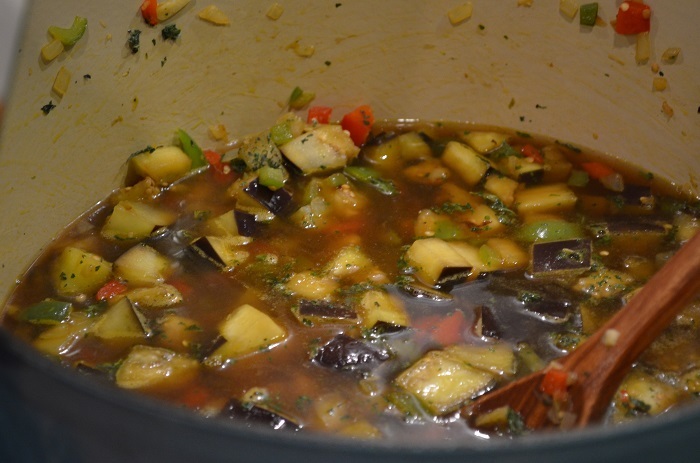 That should cook down and absorb all the oil, then you’ll add the best feature of the recipe, which is a low-sodium, all vegetarian and very rich vegetable broth. 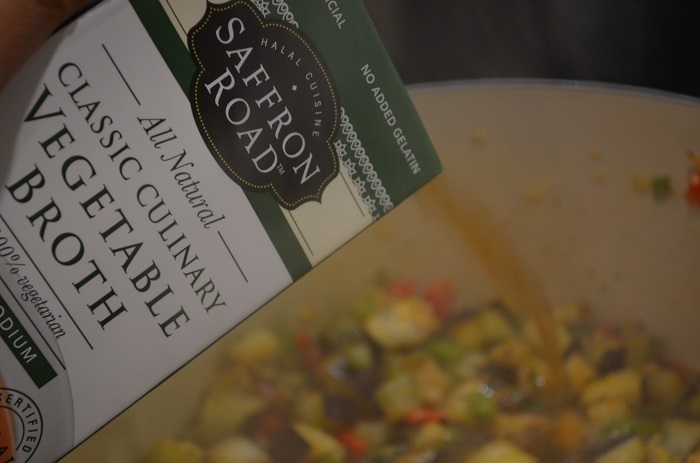 I use the Saffron Road brand because it’s not only what I trust to be good, it’s also halal- no added gelatin for sure, and the ingredients are pure quality. There’s a huge difference between adding water, good broth and really poorly made broth to a soup. I use one entire box for this soup. Look at how deep and complex the colors of the soup are. Let it come to a boil and then reduce the heat to a simmer for about 30 minutes. Then add the fideos/vermicelli (about 1 and 3/4 cups). Let them cook until fully softened, about 5-7 minutes. At this point, I add about one cup of water just because I’m trying to reach the consistency that my family and I prefer. If you feel like you don’t need any extra liquid, just continue cooking. Be aware, however, that the fideos/vermicelli noodles will expand and leave you less liquid than was there before. Adjust for salt and pepper, as needed. Serve warm or hot, depending on how you like it. Variations include adding tomato to the base, as well as adding small strips of chicken or beef for protein. Have I convinced you to have soup throughout the summer, especially during Ramadan? The winner of this giveaway is Maritza Maritza. Please contact us as soon as possible with your full name, address and phone number! 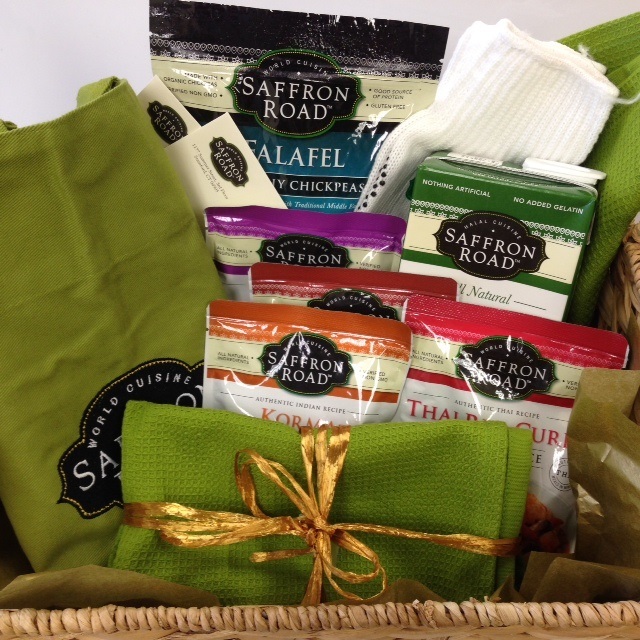 If so, tell me what you would make with the Saffron Road Culinary Classic Vegetable Broth in the comments below and you could be eligible to win this lovely gift basket by Saffron Road, full of goodies such as their globally-inspired Simmer Sauces, the Culinary Classic Vegetable Broth I just showed you all about, an apron to keep you tidy in the kitchen, a bag of their crunchy chickpeas (which are nonGMO, by the way) and some coupons. To enter, see details below the picture..
And be sure to “Like” Saffron Road on Facebook to get lots of great information this Ramadan that will help you discover their line of halal products, many of which are gluten-free. They’re also part of the NonGMO Project, they’re Certified Humane by the Humane Farm Animal Care (HFAC) as well as certified halal by IFANCA. Please read our official giveaway guidelines before entering, as leaving a comment for entry indicates to us that you have read and understood. Winners will be notified at this blog post once the contest is over. Please re-visit this page to find out. Contest ends on Sunday, June 22, 2014 at 12:01 AM CST. 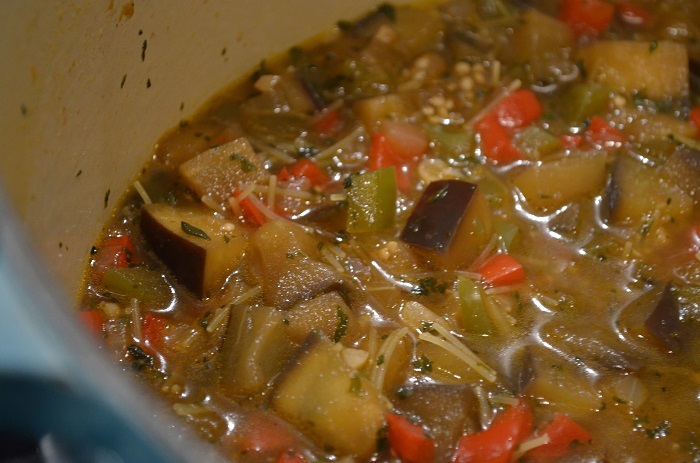 An elegant eggplant soup perfect for a light vegetarian summer dish, yet versatile enough to make it a little heartier with the addition of chicken or beef. Heat oil in a large Dutch oven or stock pot. Add the onion and saute until translucent, but not longer than that. 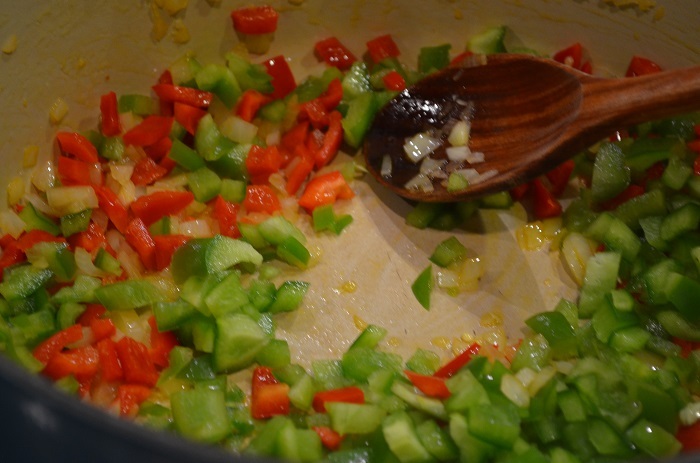 Add the green pepper and red pepper and continue to saute until all of the peppers are softened. 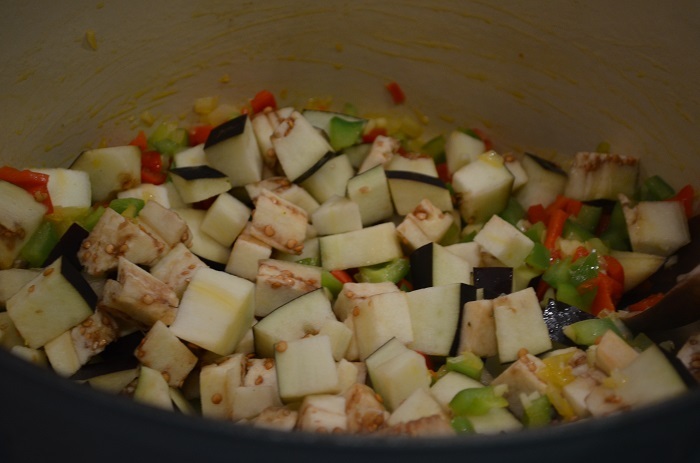 Add the eggplant and garlic, mixing in the oil and other ingredients completely. Add the herbs, salt and pepper. Pour in the broth and bring the mixture to a boil, then slowly reduce heat. Cook for 30 minutes on low, uncovered. Adjust for salt and pepper. Add the fideos/vermicelli noodles and one cup of water. Let cook for about 5-7 minutes or until noodles are completely softened. Remove from heat and serve immediately or when dish is lukewarm. Serve with a bit of Parmesan cheese and rustic bread, if desired. *Noodles will thicken once the soup sits for a time and/or it is refrigerated. You can easily add more broth or water to bring it back to the preferred texture. Adjust for salt and pepper, as needed. 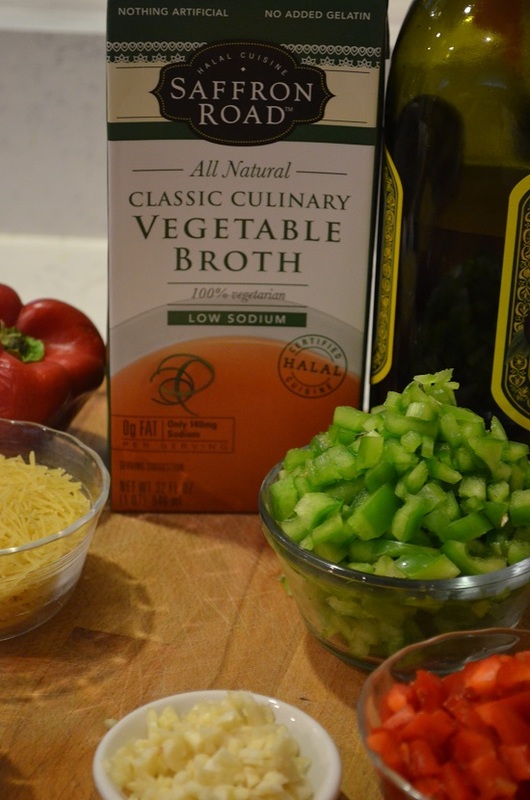 I would use the broth for risotto or even for a pulaou dish to add mor nutrients and vegs to our diet. 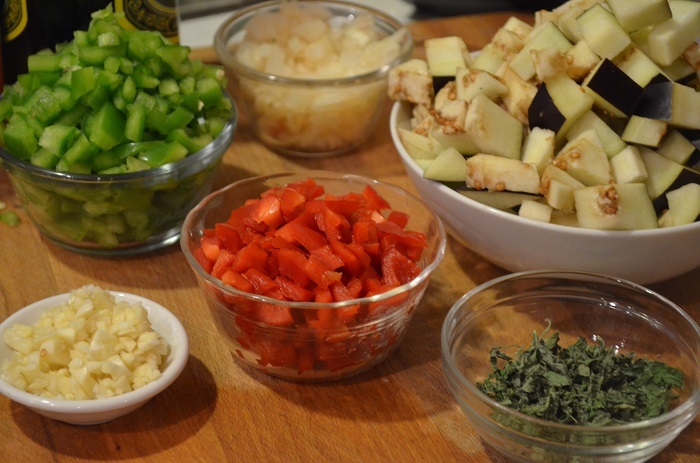 I would love to add the broth to makes soups n rice dishes…. 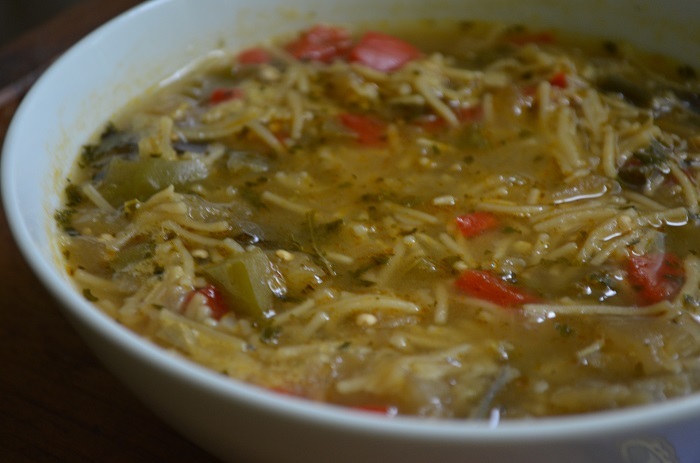 I am pregnant and craving soups all the time so this would really help, and be a healthy choice! I would use the broth to make rice and soups! I love soups all kinds I usually make my broth but a healthy alternative would be nice! I would use the broth to make brown rice, since it adds so much flavor to the rice! I would use the broth to make spicy chinese soups which require broths made from scratch, this would be a time saver for me especially because I am pregnant. This is definitely a very generous gift basket. I love Saffron Road products. I would use the vegetable broth to make a chilled soup like gazpacho and of course with plenty of seasonal vegetables, I would really love a good bowl of minestrone soup. Thanks for the delicious recipe! I would use the vegetable broth for another great nutritious summer soup: spicy cannellini bean and sweet potato soup with collard greens. This is a great sounding recipe! And, I understand that I must check back. Would definately use it in a noodle soup or in Risotto or a pillau. I would also use it for soup. 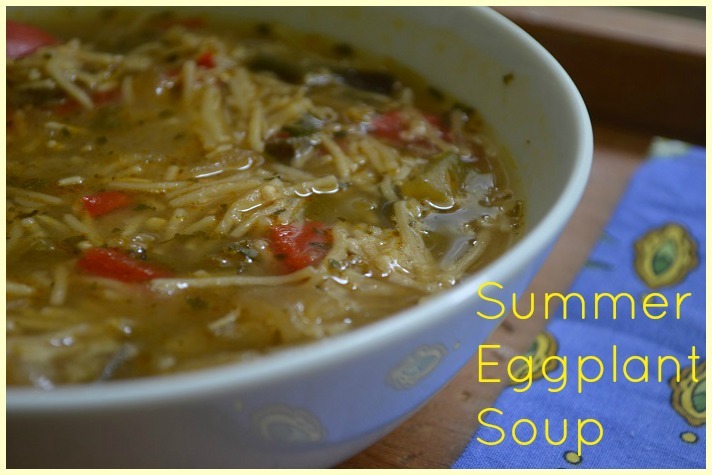 I’m so glad you wrote about soup in the summer! I hear that all the time. And I’m so looking forward to having Algerian chorba during Ramadan, inshaAllah. There is nothing as comforting as that dish after a long day of fasting. I’d use the broth to make biryani & pilaf recipes,also for more flavorful curries & kormas..<3 Saffron Road products! This broth would be ideal in my hot and sour soup that u always make for my family. It would save so much time and be much more nutritious if I were to use Saffron Road’s vegetable broth!! 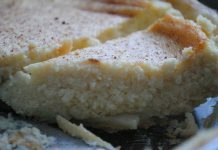 I would make my husband’s favorite for Ramadan: harira. And also a great vegetable noodle soup. Yum! I would love to win this one have a great day. Broths add a whole dimension to foods. The added flavor makes for dishes that are full of flavor and richness. Your soup sounds so yummy! I want to try making it for sure! I make a really delicious spicy pumpkin chickpea soup that would be really good with this broth. During Ramadan we always have chicken or lentil soup after breaking our fast. I would make this soup and a curried lentil soup. I would definitely use it for all my crockpot dishes. 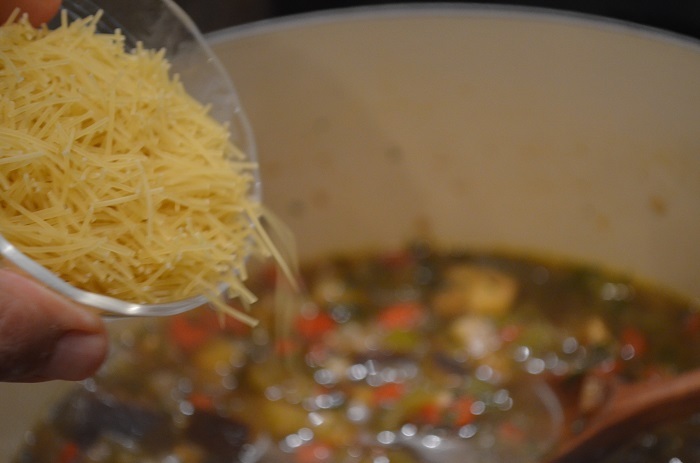 Thanks for this recipe it’s a wonderful way to start an Iftar meal, trying it out before Ramadan starts in order to perfect it by then & for sure using the saffron vegetable broth in the recipe. I am also thinking of adding chicken for some protein. 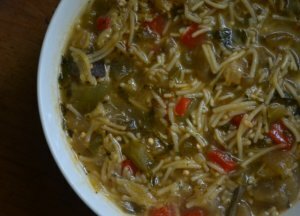 I would make this soup and plenty of other recipes for my family of six. This will save me some time in the kitchen and when I break my fast at work I can transport the soup in a thermos. I would you the broth to make a freezer full of varieties with different roasted veggies…all gltuen free though, rice noodles do the trick! I absolutely make soup during the summer, and every single day during Ramadan. 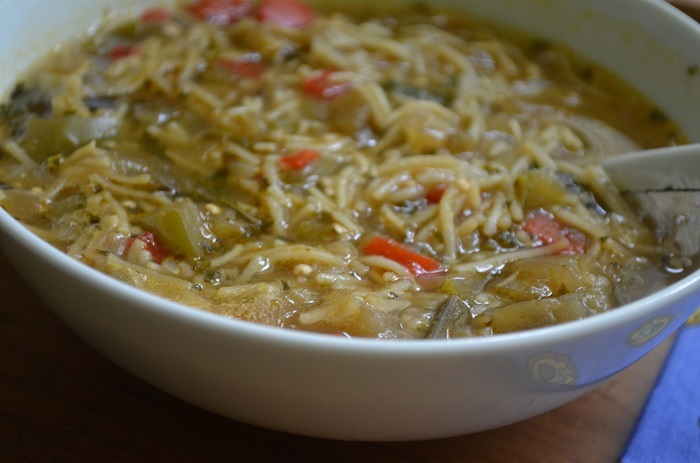 For a simple and quick iftar soup, I just use broth, garlic, onion and vermicelli. Ramadan Kareem! As a busy student trying to get through the physician assistant program during Ramadan, I would use the broth to make ahead and store kichdi (kichuri) as well as some chicken and black bean tortilla soup (my fave any time of the year!). Thanks for putting up all these great Ramadan prep tips, they will surely come in handy! I would use the broth in my soups! I love a good tasting soup! I would use the broth for stew, and also to keep meat tender as well. Thank you for the wonderful giveaway. During Ramadan, I always find that I tend to prepare more dishes with a liquid base quite possibly to replenish the fluids lost throughout the day but I love to replace the water in just about any savory recipe with a broth. Not only does it add flavor but the added nutrients and proteins make me that much more confident about serving it to my friends and family. What I would make with the broth is Tuscan Bean Soup! I would use the broth in a fresh summer squash soup. 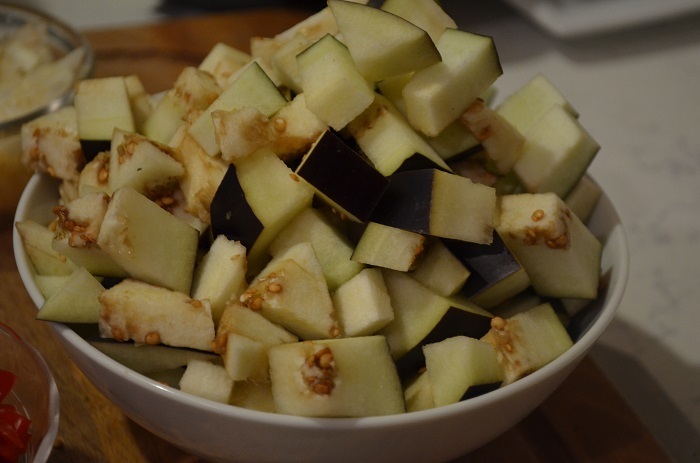 Despite having a deep love of eggplant, I never seem to get it right when I cook with it. It’s either over cooked (mush) or undercooked. Does this recipe cook it so the pieces are still easily picked up with a spoon? In soup I guess the mush wouldn’t matter but I love the texture (and taste) of eggplant when cooked perfected.